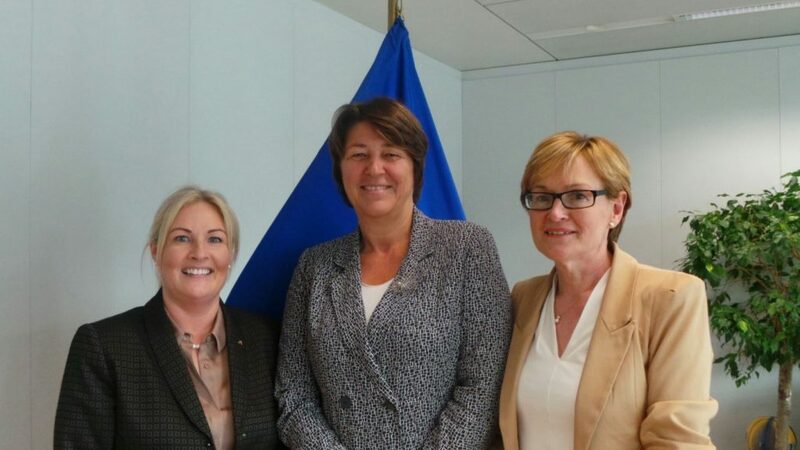 RHA has stated today, 18th of September, that it held a very constructive meeting in Brussels earlier this week with Commissioner Bulc regarding the on-going migrant crisis affecting Irish road haulage operators when transiting France. The meeting was attended by the President of the IRHA Ms Verona Murphy and Irish MEP, now Vice President of the European Parliament, Ms Mairead McGuinness. The IRHA highlighted the difficulties Irish haulage operators are facing with on-going efforts by migrants to enter Irish registered vehicles and the extortionate fines that are then levied on a haulage operator despite taking all available steps to prevent such entry to their vehicle. The IRHA urged Commissioner Bulc to revisit the unacceptable requirement on road haulage operators to effectively act as border agents. The Commissioner stressed that the Commission would be open to any request or proposal from the Department of Transport, Tourism and Sport to invoke Article 14 (2) of Regulation 561 of 2006 should circumstances deteriorate to the previously unacceptable levels experienced over the summer period. Other matters of concern discussed with the Commissioner were the *Lorry Road User Levy in NI / UK and the associated adverse monetary effect its implementation has had on the sector in Ireland. Furthermore, the Commissioner was informed of the Review of Regulation 561 of 2006 (*drivers hours) that the IRHA is heavily involved with at European level. Commissioner Bulc also requested that the IRHA submit a document outlining the anomalies in the interpretation of road haulage legislation from one Member State to the next. The Commissioner commended the IRHA for its commitment and contribution to the road haulage industry, particularly during the very challenging period for the sector over the summer period. The IRHA highlighted its appreciation of the pro-active support of Ms Mairead McGuinness MEP for the industry to date. Ms McGuinness has been very engaging in making representations at European level and in-turn liaising with the IRHA and its members. The LRUL was introduced under a European Directive, Directive 1999/62/EC, that caps the maximum daily charge that can be levied at €11. Since the introduction of the levy, the cost has been hovering around €12.70 with that figure, as of today, at €15 due to fluctuations in the exchange rate; this is in contravention of the perimeters stipulated with the Directive. Driver’s hours – The IRHA is making representations as a result of the industry’s high dependency on ferry services to reach the European market. The IRHA is seeking the implementation of an enforcement approach so that when a haulage vehicle is making a ferry journey, that sea crossing should be considered as a rest period (it is currently not considered rest) as the driver is treated as a passenger when on-board the vessel and therefore accommodation is provided.